university curriculum is timely. It is necessary to review the curriculum to ensure that it is relevant to national needs and meets global standards. The president’s advocacy is in order, especially at this time that economic development is knowledge-driven. For our universities to be part of the global knowledge-sharing, we must review our varsity curriculum in line with global best practices. The President, who made the call at the recent 7th convocation ceremony of the National Open University of Nigeria (NOUN), in Abuja, urged universities to be innovative in their approach to curriculum development. He also charged the NUC to embark on strategic capacity building so that lecturers would be abreast of developments in their areas of specialisation, and assured the nation of his administration’s commitment to all facets of university education, including Open and Distance Learning. In reviewing the nation’s university curriculum, we urge the NUC and the varsities to work towards producing a curriculum that tilts more towards practical than theoretical knowledge. There should be a seamless blend of theory and practice in our teaching and learning processes. Since the job of university academics involves research and teaching, the research must be skewed towards problem-solving. If this is done, the research outcomes will be easy to commercialise, thereby ensuring the desired meeting of the gown and the town. 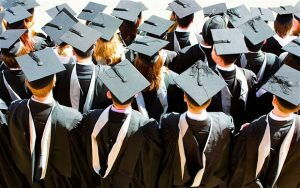 It is sad to observe that the much-needed linkage between university research findings and national industrial needs remains largely unrealised. There is a yawning gap between the gown and the town in terms of sharing and utilisation of research outcomes in real life situations. That gap contributes to the nation’s graduate unemployment statistics. Many of our graduates lack the practical skills that are required in our industries and other workplaces. Much of the knowledge acquired by graduates in our universities are also said to be outdated and irrelevant to the world of work today. For this gap to be bridged, the universities must develop curriculum that is relevant to our industries and the society at large, as is done in many developed countries. Emphasis should be on practical knowledge that can be used to solve societal problems. We also need to lay more emphasis on science and technological courses than the arts and social sciences that are theoretical. We are living in a scientific and technology-driven world. For our universities to make a huge difference, they must offer entrepreneurial courses so as to produce graduates who can create jobs rather than job seekers. Many of our universities are already embracing entrepreneurial education. They should make the entrepreneurship education functional and effective. It should not be cosmetic or designed only to meet regulatory requirements. The universities which are yet to afford their students entrepreneurial education should begin to do so immediately. As part of the curriculum review exercise, our university lecturers must avail themselves of opportunities for training and retraining through local and international seminars and workshops. They should be encouraged to go for sabbaticals locally and abroad to broaden their knowledge. They should also be availed of local and international journals as well as the latest textbooks and other developments in their various fields. The nation’s university libraries and laboratories should be refurbished and upgraded in line with the new curriculum. Every Nigerian university must renew focus on research and development as part of the curriculum review exercise. Curriculum review should be a regular feature of our varsity system so that the institutions can keep in tune with breakthroughs in the different fields of knowledge. Let the universities embrace the change in curriculum to move the country forward. The NUC should ensure that the curriculum review is expeditiously and thoroughly carried out.